Last week, I was catching up on my kellehampton.com posts that I’ve missed and I came across this one…Easy Pumpkin Carving Party. I have to say it right now. I was super envious. We are sitting under a foot of snow and it’s freezing cold outside and there was NO WAY we could ever have a magical woodsy autumn pumpkin carving party. When I finished moping and fussing, I got to thinking. We could do it INSIDE! Take that, snowy Canadian autumn! It was probably the most inexpensive party I have ever done. My friend had diligently raked her yard before the snow fell and she still had the bags of leaves! I snagged a bag from her, gathered up the pine cones from our Mud Pie Station, and snooped around in the pantry for some goodies. 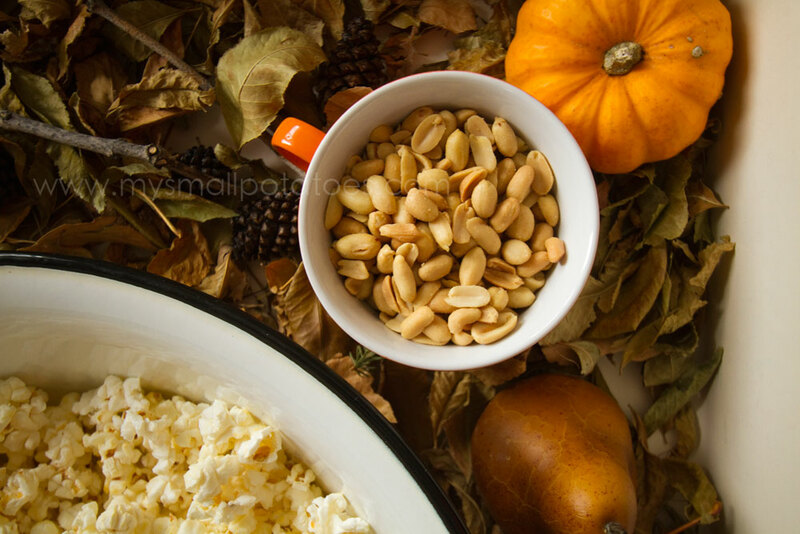 Here is what I came up with… Popcorn, peanuts, pumpkin snickerdoodles, and sparkling apple juice. Easy. I used some of the leaves and some ornamental pumpkins, pears, pinecones, and apples as decorations. I tied kitchen strung around the stemware for a little homespun bling… I set out drop cloths on the kitchen floor and then poured the rest of the leaves around to give it an outdoor, woodsy feel…it smelled SO good in my house, let me tell you! I made sure we had spoons for digging out pumpkin pulp… And pencils and paper to plan and draw our pumpkin faces… The ladybugs started to crawl out from under the leaves and we were all excited to have them as party guests… I cut the lids off the pumpkins for the kids and they got started… Make sure you have a bucket or trashcan to put all the slimy pulp in so it doesn’t get all over your “picnic blankets”! Of course, it wasn’t long before his big sister started flinging pumpkin slime at him. Maybe keep some wash cloths close by, in case of shenanigans! My kids loved sitting in the warm kitchen with the smell of autumn in the air as they watched the icy, snowy contrast outside the patio windows. They sipped their cider from real glasses, played with lady bugs, tossed the leaves around, and created their pumpkin lanterns. They even “carved” their apples! Here’s a look at what our pumpkins looked like when we finished… We loved our autumn kitchen so much, we left it overnight. The kids came down in the morning and played in the leaves with their Hotwheels and stuffed animals. I wanted the smalls to enjoy some of our autumn kitchen fun when they arrived today, so I made them a special Autumn FairyLand in our sensory table… They are piling up the leaves and hiding the fairies as I write this. We may not have been able to go out in the woods to carve our pumpkins, but we still had a very memorable saturday afternoon. Right here in our cozy kitchen. Happy Autumn, everyone! Your photos are amazing. The colors pop right off the page. I need to read you blogs about photography! You’d never know it was cold and snowy outside. Looks so cozy!! Love your kitchen! And the party looks like a lot of fun…! oh and also meant to say, I was drawn to your blog by the cover photo of painted child’s toes. I love baby/toddler/little children’s toes, they are my equivalent of the fluffy newborn hair on the back of a baby’s neck ! Yes!! I agree!! Wee toes are sooo precious! Glad you found is here! Welcome! How do you do it all?!?! It’s AMAZING!!! So lovely! As always, your photos are just beautiful!! Happy Halloween.